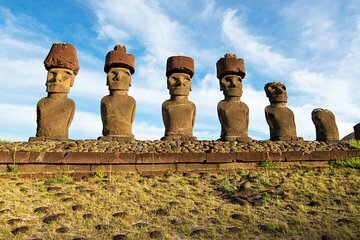 Spend the day immersed in Easter Island's culture, history, and folklore during this small-group tour. With just eight other travelers, follow your guide to the island's most important landmarks, including Puna Pau, Rano Kau, Ahu Akivi, and others. Round-trip hotel transportation included. Small-group tour ensures personalized attention and an intimate atmosphere. This was an amazing tour! One of the best I have ever taken. Our guide, Sophia, was incredible with such a depth of knowledge and insight, in addition to being friendly and fun. She not only provided information about the sites we were visiting but also provided more general background and history about the island, its people, and current events. I learned so much it was almost information overload. The small group was a perfect way to see the sights of Easter Island. I had done some touring on my own the prior day but having such a good guide really brought the culture and history to life. I highly recommend this company and this tour. I made the mistake of booking with a different company for a subsequent and I will always regret that decision, as that Greyline tour was little more than picture stops. If I make it back to Rapa Nui, I will be sure to book with this company instead. Absolutely loved this tour! Our guide, Merahy, was just incredible. She gave us the rich history of Easter Island, the Moai, and Napa Rui people. Seeing Orongo and learning the history of the Birdman was especially interesting. She was extremely knowledgeable in addition to having a warm, fun, and lovely disposition. I learned so much! She was also a great photographer for us! The small group was a perfect way to see the sights of Easter Island. I highly recommend you take this tour and hope that you get Merahy as your guide! I took this tour with Driver/guide Bruna and she was absolutely amazing, one of the best guides I have ever had on a day tour. She frequently would see something interesting along the road and would pull over to show it to us. Some burned trees launched us into a discussion of farming on the island. She was so knowledgeable about the history and context of everything on the tour. She is very funny and animated and guided us for over 8 hours. You need a good guide to really appreciate what you are seeing. Take this with the full day south/east tour and you have seen all the best sites. Perfect! Great excellent, small group tour that stopped at all the major points, as well as lesser known areas. Our guide/driver Sofia was top notch. Her insights into the culture and history really gave us an understanding of the Moai and traditions. Definitely a must do along with the corresponding South/East tour. Highly recommend this company and tour - we spoke to others in our hotel and in restaurants who felt rushed or took tours that were little more than 'picture stops' - not so for us! It was great tour. With a super nice and well informed tour guide Eliza. I learned great amount of informations about theisland, and plus, we had fun. I will highy recommend this tour to all!